Do not end up spending too much time developing “the perfect strategy”. Use colleagues and other resource persons to critically reflect upon the different components of the plan. Sometimes it could be good to do some communicative work before even starting according to the plan. It could be to carry out initial awareness raising activities, such as developing brochures and media releases, which sometimes help in the development of a plan/strategy by helping you to think about your target groups and key messages in an early phase, but also to prepare a wider audience for the upcoming activities. Include a brief summary of the situation assessment made as suggested in checklist 1. Also refer to other document you may have produced relating to the situation assessment (e.g. include as an annex). Often there has been a lot of projects or activities going on from which you build your new initiative. This is worth mentioning so that one realizes that the new initiative is part of a broader context and shows that you are aware of what has been done before. Educating or training people in how to apply new management, technologies, etc. The most basic questions you have to ask yourself is: “Why are you using communications as tools to enable change?” This is related to the fact that communications by itself seldom is enough to achieve changes in behaviour (if more radical). Goals and objectives should be explained in three bullet points or less. They should be clear, specific and realistic, stating who will do or change what by when and by how much. If you can make your objectives clearly measurable then it will be easier for you to identify and communicate your successes with your target groups, affiliates and partners. 3. Who’s doing the communicating and with what resources (responsibilities)? In checklist 1 a partial assessment is presented of the current available resources. You need to be realistic about your financial and personal resources and exactly who will implement the different measures. If you have to prioritize: What is most important to do? Working in a team is recommended. It will create stability, decrease risks, and make sure that complementary competencies might be more easily available. A communication team may include representatives from your partner organisations, technical specialists, or members of the targeted groups. You may also wish to contract external communications consultants. Earlier you should have determined and specified who your target groups are differentiating between (see Help desk > Communication plans > Target group); a) the primary target group you are trying to influence and, b) those target groups that will support you or influence your main target group (the ones you are trying to change). In this part of the communication plan you can here include (or in an annex) any target group investigation that you or any other actor may have conducted that describes in more detail who your target group are and what they need, why they think or act the way they do. In almost all extension activities we have a strong focus on the content of our communication. Of course, a big part of communications is deciding what you need to say – your main messages. Besides the information given about the specific subject (f.i., scientific information), you will also need to develop a set of key messages that explains exactly why you want to reach out with this information and what it is trying to achieve (objectives and goals). But you will also need to develop clear messages that state what you want your target audiences to know, think, or do differently. Often we have a tendency to hide our main messages in too much information, which makes it hard for the target group to realise what is most important to know or learn. By preparing and stating the main messages already early in the planning phase it will help you develop relevant activities and present pedagogic valuable materials. Your messages depend on who you are trying to reach and what you want the message to achieve. Ideally you need to tailor your message to meet the needs of each different target audience. This will depend on their understanding of the issue, what you want them to think or do, and the personal costs or benefits they associate with making these changes. In most cases, nobody will change anything unless they see a personal benefit or a way to avoid personal costs – whether this be financial or psychological. Due to budget restrictions, a high level of target group differentiation is not always possible, but one should strive to specify the different target groups as much as possible and adapt the methods and tools to each and every one of those. Consistent with and relevant to your target groups’ needs and pre-conditions. Simple! This is of course a challenge when working with complex issues, but in each step of a learning process (progression) one can reduce complexity without simplifying too much. Use plain language that is active and compelling from the target groups’ perspectives. Create messages that help achieve your specific objective. This does not mean simply restating your goals! A winning message needs to be compelling to your target group. Once you have identified your main messages, make sure to use them consistently and repeatedly in all future communications. Repetition is important in all communication. At this point, you know what you want to achieve (goals and objectives), who will do it for you (target groups), and what messages you will send to your audiences to get them to act or think the way you want them to. Now you have to deliver the messages, through either products or activities. Home and field visits – workshops, demonstrations, advisory services, coaching, etc. Learning community events – public meeting, bee-keeping association events or meeting, study groups, etc. Professional organizations – meetings, workplace events, business networks, etc. Social media – Skype, WhatsApp, Messanger, etc. benefit of bees and pollination, etc). What is your news? You need to find an approach that grabs the journalist’s interest. What makes your goals and objectives current or relevant to their readers? Is there a conflict? What is the human side of the story? What makes it new or a headline? What type of coverage do you want (e.g. basic news, feature article, editorial, public service announcement)? Do you have a good media contact list that’s up-to-date and linked to those media that will reach your target groups? Be prepared! How will you respond when the media calls you? Are you ready for tough questions? Have you already worked out ‘positions’ or key messages for the media and do you have evidence to support what you say? Will you launch your project, program or communication plan with a media-related activity (e.g. press release, conference, trip)? If so, what is important to stress so that you create an engagement among key actors and the primary target groups? What combination of media-related products and events will you use in the future, when implementing activities or wrapping up a project? Do not send information repeatedly to journalists – once they perceive you as a source of useless information, they won’t even bother looking at anything you send in the future. Prepare ‘media kits’ for media – folders that include all information that may be of interest, distributed during press conferences and field trips with the press in the field, among other media events. Designate one person in your organization to serve as the media spokesperson. Depending on the issue all media calls could be directed to these people. This could assure that the relevant and right information reach the journalist. These persons can always link journalists to the most suitable team members or other resource persons, if necessary. Once you’ve decided on what kind of products you will develop, such as brochures, folders, publications or fact sheets, a major question is how many you will produce. This has become a bit easier due to Internet, but most bee-keepers still prefer written material. Such production can be very costly, as can distribution and, if needed, translation. Imagine that you decide to produce a nice glossy brochure, 8 pages long. 1000 copies sound like a good idea. So, the publications are printed, and many boxes are delivered to your office. You have a distribution list of about 100 to which you send copies. Over the next few months, you’re able to distribute a few hundred more here and there. After that, about 500 copies are shipped to the storage room in the basement. And you never know whether the publications you actually distributed had any effect or not. This is a common situation. It might have been worthwhile, but nevertheless think carefully about who you are trying to distribute to (target groups) and the costs (from production to distribution). A short notice linking to a homepage for more information might actually be much more effective than a nice glossy brochure. Before ‘launching’ all your activities in the real world, you might pre-test your messages and products with a smaller segment of your target group. This will help you assess if everything really works the way you thought it would. This process can prevent costly, and sometimes embarrassing, mistakes before it is too late!Remember – your target group is the expert. Find other, unintended meanings in your messages? Prefer words, models or pictures? Get motivated by your message? Have easy access to your product or activity? Find your products appealing or ‘grabbing’? Differ among themselves in terms of reaction (e.g. gender, age, size of operation)? Remember your key messages later? Have a better understanding of an issue or solution after seeing the message? There are different methods for pre-testing, using individual selected from your target group, making a focus group interview or even ‘test run’ your concepts with a smaller group. Fundamentally, pre-testing means that you really need to listen to your target audiences and make any changes to improve the way your message is received and acted upon. This is especially important if you will spend a lot of money on single effort in order create change. Before strategy implementation, it’s ideal to create some kind of ‘Action Plan’. Such a plan should show who will implement the products and activities listed in the strategy, as well as when, where and how (task, person responsible, and date). With your strategy, pre-testing and action plan finalized, it’s time for you to implement. Good luck! Evaluation provides an opportunity to find out if your hard work has really made a difference. By assessing what does and does not work, you will use lessons learned to improve your efforts in the future. You will also be able to show your team, partners and funders exactly what has been achieved. Has the issue been communicated properly? Have you been able to motivate people to take required actions? But evaluations might be focusing on different aspects and relations, linking specific aspects of a program or project to each other. 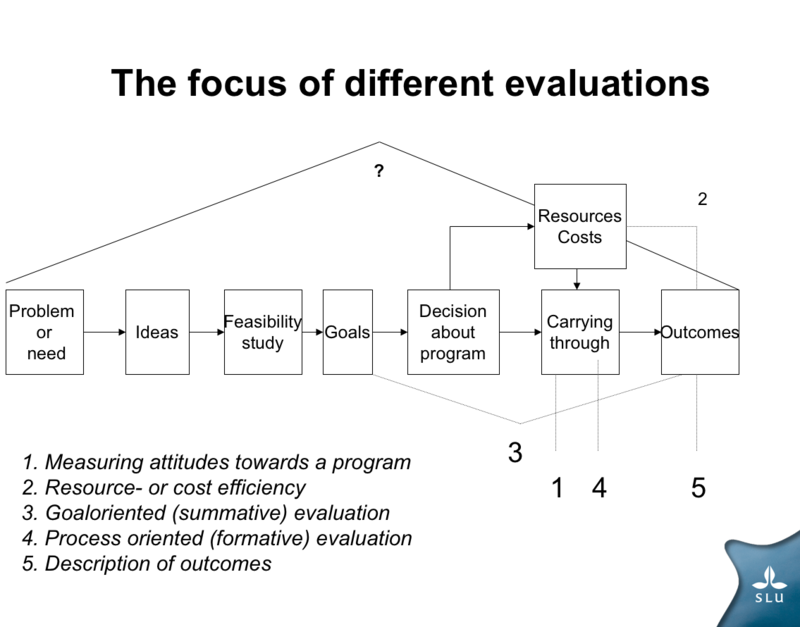 In the figure below the different forms of evaluations are illustrated. It is important to note that monitoring and evaluation should be done throughout the entire process, as well as at the end. Effective monitoring involves keeping on top of all activities and making sure that implementation is on the right path towards achieving your goals. Monitoring might reveal that your strategy is not working – that means you may need to change your strategy during the implementation phase. It is important to be flexible! A strategy is a living document and does not needs to be followed at all costs. Instead it is a tool to help you get results, and if the anticipated results are not coming, then the tool might need to be changed. It’s also important that your system of monitoring and evaluation is planned from the start, so you know exactly what to assess right from the beginning. Evaluations might be done both continuously and at the end (of a project period). The former is often labelled a formative evaluation (a method to continuously support development and change), the latter a summative evaluation (a method to control goal fulfilment). Once you know what you are monitoring (e.g. attitudes, efficiency, goal fulfilment), there are a number of ways how to monitor or measure progress. The important thing is to make sure you ask the right questions for the right people. If you want to know whether your activities are helping beekeepers to become more aware of strategies to create more resilient bee populations, then you need to ask them. The same goes for assessing whether your communications have helped beekeepers to implement new management or techniques. You need to make sure that the results you are seeing are directly linked to your activities – and this is usually not that easy. Your target group may be changing the way you want them to, but maybe your efforts have nothing to do with it! Maybe they are doing it because of a change that has occurred elsewhere such as other information sources, new regulations or an economic incentive. How many participated in the different communication activities? How many enquiries or requests for further information were generated? How many people were reached through the channels used? How many were target group members? How big media coverage and/or many media stories appeared as a result of your work? How many materials were handed or sent out to the primary target groups? How many partners were engaged in distributing and/or presenting the same key messages? Were all activities carried out on budget and according to the timeline? If not, why not? Did access to relevant information improved (for the target groups)? How did the target group find out about your initiative? How where they reached? Counting the number of brochures that have been given out, etc. You may then need to include assumptions and future scenarios in your monitoring and evaluation if you want to relate your communications to systems or behavioural goals. For example, you could argue that, based on the changes in perception caused through your communication activities, you expect the actions of your target group to change (in the future), and that this will lead to a more sustainable bee-keeping sector, etc. The important thing is not make statements which does not hold for a closer look. During your monitoring efforts, you will hopefully uncover a number of successes or good examples among both what you have done as well as among the target group. While these can tell you a lot about how the communications are doing, they can also be packaged into success stories. Such positive, simple and descriptive stories are great tools for communicating both to target groups, partners as well as donors! They can also be incredibly useful in generating media attention, gaining more interest and additional support for your work. A well written and reflective final report is also a valuable tool for communication, not least to show you team, partners and donors what you have achieved and how the communication plan and strategy has worked in practice. Such a report will also be useful for you in planning any next stage or strategy. A final report should not only cover what you have done in a more descriptive way, but also basically state whether the goals and objectives of your communication plan were achieved or not, as well as why and how. It should explain how monitoring was used to make your evaluation, as well as lessons learned and recommendations for how planning and implementation might have been improved. We can always become better in communication, planning and process design, why the development of a final report is an important possibility for learning.